Soak up the pre-show atmosphere in our most contemporary space and enjoy a wide range of beers and spirits, including local favourites Hepworths, Brighton Bier, Brighton Gin and a choice of wines. The Café-bar is open 45 minutes before evening performances and 30 minutes before standing gigs. It is also open for special events and open days. Please note: While we focus on laying the groundwork for our upcoming refurbishment plans for the Grade 1 listed Corn Exchange and Studio Theatre, we regret there will be no regular daytime café facility on-site. Visit the webpage for more information about changes affecting your visit. 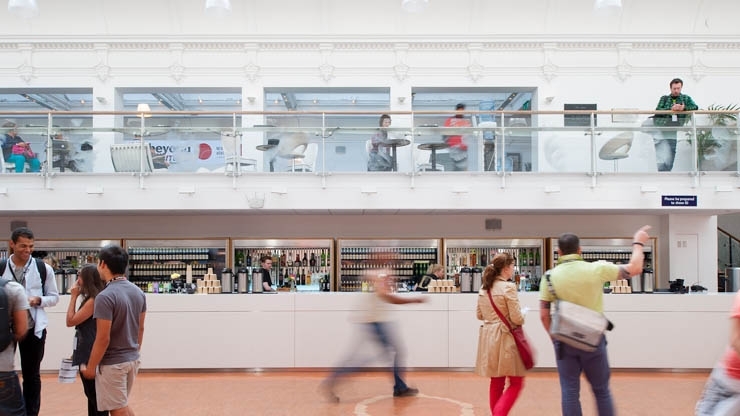 Throughout the Festival, Brighton Dome’s Café-bar will be open Wed to Sun 11am – 3pm serving a selection of delicious cakes, snacks and speciality coffees. You can also enjoy the café and bars for evening performances in the Concert Hall, from when the doors open until the end of the interval. Members receive a 20% discount.